This mausoleum was built by Queen Noor Jahan in the memory of her father Mirza Ghias Beg and strongly depicts the Persian style of architectural design. It is also known as the jewel box or baby Taj Mahal as it is the exact smaller version of the Taj Mahal itself. Instead of dome, the tomb has canopy rooftop with squat minarets on all the four sides. Constructed midst of a Charbagh style garden, this is the first ever marble structure of Agra. The entrance is constructed out of Red stone with beautiful garden adoring both the sides of the entrance. The design of the gate has a mixture of white marble and red stone amalgamation done in a very intricate yet beautiful manner. Thousands of dazzling motifs and colorful paintings adore the walls and roofs of the tomb, thus making it one of the best architectural glory of the Mughal era. 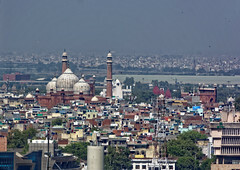 How to Reach: It is basically a 20 minutes’ drive from Taj Mahal and one need to hire a cab or an auto to reach there. "